What happens when you drop the Galaxy Note 5? Getting the latest and hottest tech and seeing how well it survives getting thrown about is a noble tradition, stretching back aeons to when early man held aloft the first wheel and promptly smashed it against the wall of a cave. Little has changed in the following years, which is why David Rahimi from PhoneBuff felt compelled to drop the new Galaxy Note 5 on the floor to see just how robust the handset really is. Although the thought of dropping such a new (and expensive) bit of kit deliberately might seem a little crazy, it does serve a good purpose for the rest of us as when we put down a fair wad of cash for a gadget we want to make sure it's solid enough to withstand the odd accidental knock or drop. As Rahimi was kind enough to video his drop test we can get a close look at how well the Galaxy Note 5 survives a drop from waist height – the height your smartphone is most likely to fall from when you fumble while removing it from your pocket. The Samsung Galaxy Note 5 comes with a metal and glass unibody, with the metal part of the chassis most likely using a grade 6013 aluminium alloy – which is a step above its competitors. While the metal part could make the Note 5 more robust, the glass parts of the handset (that wrap themselves around the front and back of the device) won't fare quite as well. 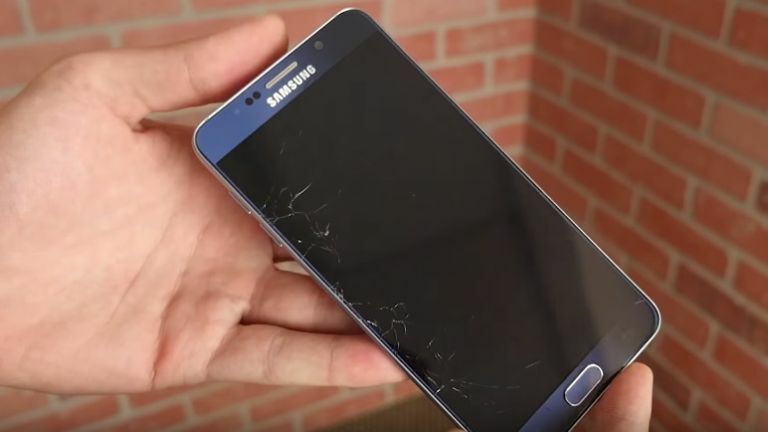 Check out the video below to see what could happen if you drop your shiny new Galaxy Note 5. If you're a proud owner, then you might want to invest in a protective case.